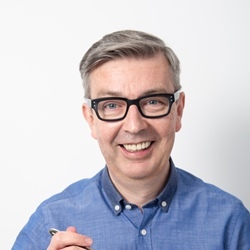 Our favourite Bake Off alumni Howard Middleton dissects this weeks' episode. Expect an emotional pastry week, featuring floppy frangipane, misshapen flaounes and un-filled vol au vents. This week, we’re rubbing in and rolling out as the seven remaining bakers get to tackle pastry. First up it’s frangipane tarts – one of my favourites. Mary and Paul are looking for crisp pastry, well-cooked frangipane and good fruity flavours. There’s a good amount of poaching going on, a fair few pears, and quite a lot of alcohol. Tamal goes for mulled wine, Ian favours Calvados and Mat has rum for his pina colada tart – Mary and Mel appear to be locked in a custody battle for his jar. It’s Kilner versus Kilner. Nadiya’s bake is intriguingly imaginative, with subtle flavours of bay leaf and rong tea. Her pears are beautifully arranged. Sadly her tart heralds the unwelcome return of the soggy bottom. She’s not alone. Paul’s Christmas tart looks meticulous but just needed longer in the oven. Proud Ian crows his self-sufficiency by using home-reared guinea fowl eggs. Mary tells him his tart lacks a glaze and Paul H says his base isn’t crispy. Ian nods dutifully, bites his tongue and suppresses the urge to chuck an egg at someone. 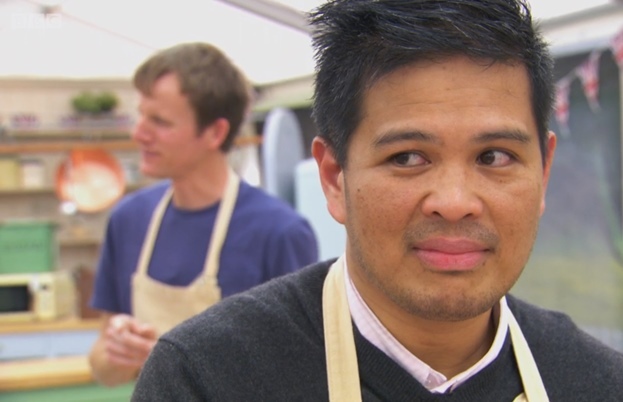 His face literally carries the burden of six seasons of Bake Off disappointment. Tamal assures Mr H that his blackberries won’t seep, but they do. However, his pastry is ‘solid’ with a perfect frangipane. Sue sums it up with what sounds like a profile on Grindr, ‘Messy top, tidy bottom’. Alvin struggles with crumbly pastry that won’t even wrap convincingly in cling film, let alone roll without sticking. Flora has over baked her pastry and tries to conceal her crust with a biscuit guard of shame. Mary calls the amaretti ‘unnecessary’. Alvin shakes his head despondently and Flora looks like she’s been sucking on a bag of sherbet lemons. Alvin channels the spirit of his retired-General father and says that failure is not an option. A general glimmer of hope is restored to the tent. Now I’m not a fan of the Bake Off’s historical interludes (you spend months auditioning and weeks practising only to have significant tent time slashed in favour of the origins of suet) but this week’s is quite a jolly tale of the unlucky pie makers of Denby Dale. Moving swiftly on. Gingham cloths away and it’s the technical. This week, Paul’s returned to his old stomping ground of Cyprus for flaouna – a cheesy filled yeasted pastry. The bakers’ blank faces get a whiff of the pungent mastic and… whoah! This tree sap flavouring is added to the dough. Most wish it wasn’t. The vague instructions leave too much room for error and Alvin produces a tray of little Cypriot pizzas. Modestly self-deprecating Mat surprises himself with a batch of near perfect flaounas. 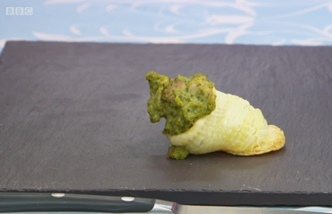 Tamal’s hopes of being the next star baker crumble as he’s judged the bottom of the batch, closely followed by Alvin. Paul's first attempt at a flaouna fold. Oh dear. 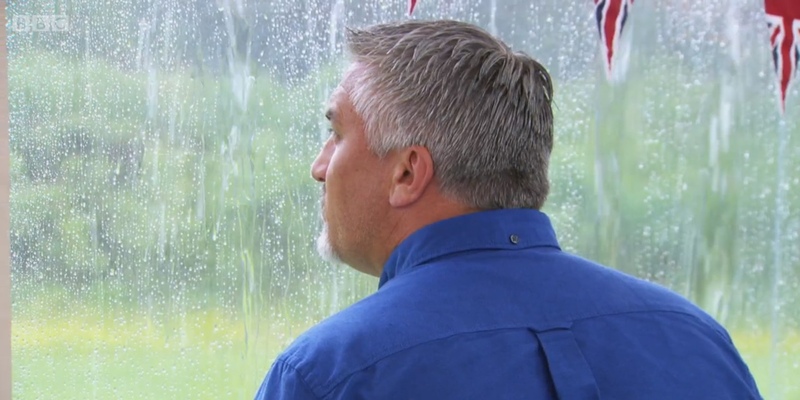 His face literally carries the burden of six seasons of Bake Off disappointment. Mary is forensically honest when she says it will take a miracle to save Alvin now. For the showstopper, you can hear the distant strains of ‘Love to Love You Baby’ and a little Demis Roussos as we sashay back to the era of Abigail’s Party for an array of vol au vents. (A classic delicacy my late Auntie Olive insisted on calling boulevants, but I digress. As usual.) 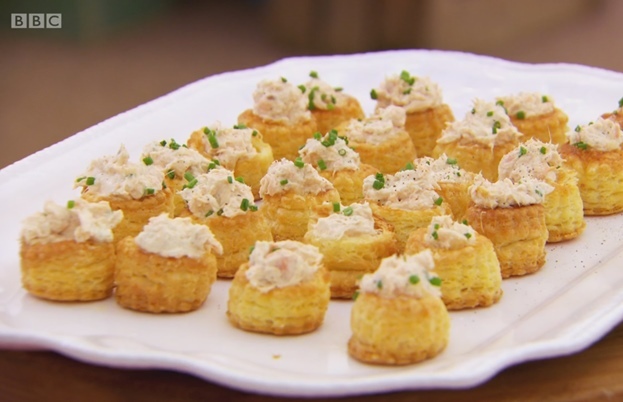 The bakers must make 48 vol au vents with two different fillings. Ian has gone for a popular three-mushroom variety with truffle oil and a potentially less appealing scallop and squid ink, which apparently his wife warned is not very nice. He ignores his wife at his peril. Flora gets Mary giddy at the prospect of chocolate puff pastry. Tamal is going for a meat fest of pulled pork and chicken with coriander, both inspired by two memorably life-changing sandwich fillings. Tamal must really enjoy his lunches. Paul admits that he’s probably the only baker to remember the vol au vents’ original outing – he goes for a respectfully retro vibe with garlic and chilli prawns and raspberry trifle flavours. Alvin aims for chicken a la king and salmon and dill but he looks to be lacking lamination. Nadiya engages us with her mother and grandmother’s flavourings, offering Bengali chicken korma and cod and clementine. Mat is going for smoked trout and horseradish and a full English breakfast, which sound amazing. Then, like promises and pie crusts, things begin to break up. 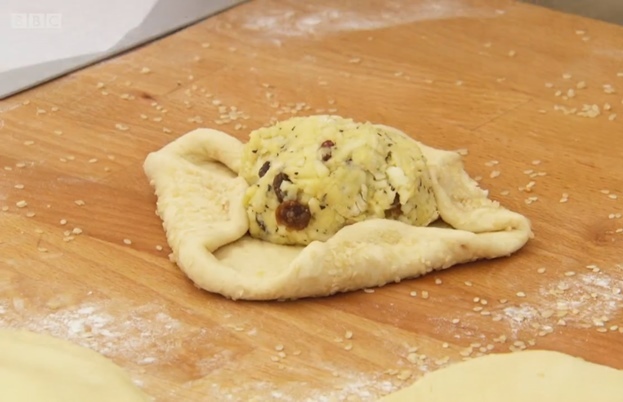 Nadiya and Mat both appear to be having cellulite problems with their puff and she makes the dangerous decision of starting her pastry again. As time ticks away, we witness what could be the most unfinished Bake Off task ever, with bakers desperately dolloping into collapsing cases. It’s not a pretty sight. Only Mat manages to achieve a decent finish. 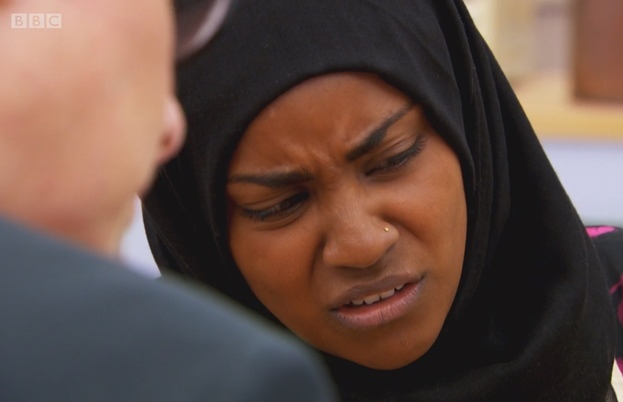 Flora gets halfway there, but Nadiya has to serve her bowls of flavoursome fillings separately. She is as crestfallen as her pastry. Someone has to draw the shortcrust straw and, perhaps inevitably, it’s Alvin – probably the most polite baker ever to grace the tent. He apologised for his bakes, he apologised for being there, he apologised for apologising. When Paul flattened his confidence with a metaphorical rolling pin, Alvin still called him ‘sir’. He breaks our hearts and goes home to write a personal thank you note to every single viewer. But ending on a high note, this week’s star baker is deservedly Mat. There’s something profoundly emotional about seeing the underdog win. But a good person triumphed and a good person went home. That’s the bittersweet quality of Bake Off.